Which is the cheapest travel insurance package? When looking for travel insurance, you are really looking for the best cover at the cheapest price, as just cheap insurance is pointless, as it might be useless when needed. So, which is the best travel insurance at the cheapest price and therefore which is the best travel insurance! Here we provide some helpful tips for getting the cheapest travel insurance, but for those with limited time, these are our top three insurance providers. Our aim is to give you the knowledge to get the best travel insurance, that is right for you, which provides the right amount of coverage. That way you don’t waste money on a policy you don’t need, plus you don’t get ripped off by a policy that’s cheap, but pointless. So before we start, travel insurance is designed to cover the cost of the unforeseen issues or mishaps, such as illness and injury or theft of your personal possessions while you are on holiday. It’s also designed to cover you if you have to cancel your trip, or need to return early due to an emergency. Travel insurance is about getting financial support when you need it the most. Don’t delay when buying travel insurance, its best to purchase the right package immediately after you have booked your first set of flights or hotel. That way you are covered for cancellation and pre-trip illness. Why? Because travel insurance won’t just cover you while you’re away, it’ll also cover you for cancellation or anything else that might go wrong BEFORE you make your trip. Will I be taking expensive personal belongings? Will I be enjoying more than one trip a year? Does the country I’m visiting have good health care? Is the country I’m visiting safe? This will help you decide what cover’s right for you, helping you judge what level of cover you require, so you don’t waste your hard earned money. 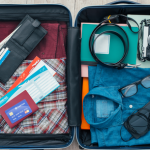 If you’re going away more than one in a year, it might be worth checking out an annual trip or multi-trip travel insurance. This is because annual cover often works out cheaper than buying two single trip policies. However always do the calculations, that way you are covered for all trips lasting less than 30days and you save both time and money by getting one policy to cover all your tips. Just be careful to check if specific locations are not covered. Check to make sure you’re not already covered, why, because a lot of companies or credit cards offer a basic level of free travel insurance. If you think you get insurance as a sweetener with your bank account, check the terms to see if it is appropriate for your trip. However Do NOT confuse this with a benefit offered with credit cards called travel accident insurance, which only covers accidents on a train, plane or in a hire car paid for on the card. Never think this means you’re completely covered. Don’t make the mistake of assuming declaring your medical conditions will dramatically increase the policy price, what’s more, don’t assume that by not telling them you are saving money. Firstly not telling the insurance provider will void your insurance, therefore it was pointless getting it in the first place. Lastly, you might be surprised to find that your medical condition premium doesn’t dramatically increase the price, as such you get good, quality cover that is valid. Having a few drinks can make your claim invalid, so be careful when you have an alcoholic drink on holiday. If you lose something or have an accident, the insurance policy may not cover you, even if they were only a bit tipsy. Insurers all have different interpretations – ranging in T&Cs from ‘drinking too much’ to ‘approx four pints’ to ‘alcoholic abuse’.